Movie Review: José Padilha’s “RoboCop” was loosely based on Paul Verhoeven’s first version from 1987, lacking the impact and surprise created in those times. 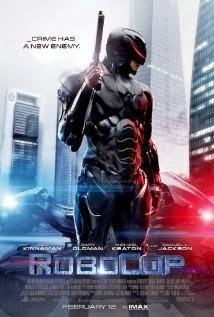 The story follows officer Alex Murphy (Joel Kinnaman) who was severely mutilated during a criminal attack occurred in his own house, becoming the much-awaited police officer, half-man half-machine, responsible for cleaning the dangerous streets of Detroit in safety conditions. This achievement was possible due to the creativity of Dr. Norton (Gary Oldman), assigned by the grasping CEO of OmniCorp, Raymond Sellars (Michael Keaton), to create an infallible agent who shows no anger or fear, but certain human emotions. At first, this human side showed undesirable instabilities in the line of duty, forcing Dr. Norton to reformulate his plans for Sellars’ satisfaction but for the sadness of Murphy’s family. This first part of the film was the most interesting, replaced in the end by the usual banality of indistinguishable machine-gun shots in confused action scenes. The heavy darkness evinced throughout the film, proves Padilha as a humorless helmer, much more efficient in depicting stressful Brazilian slums (“Elite Squad”) or factual shocking occurrences (“Bus 174”). Despite watchable and technically competent (some images are visually strong), I have no doubt that Padilha could have done much better, especially if we consider the lower budgets and quality of his past films.